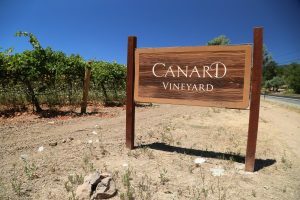 Canard Vineyard has been producing wine commercially in the Napa Valley since 1984. Today 22 acres of vines are planted on the property – its a very historic site. Rich and Carolyn Czapleski are only the properties’ 4th owners since the original owner acquired the land from a General Vallejo land grant. The Czapleskis purchased this north valley location in 1983 after looking for property close to the Bay Area where they could ‘get away’ and be in a rural location. Besides using some of the fruit for their own wines, they continue to sell some of their grapes. Old Vine Zinfandel was the only wine they made for a number of years until more recently branching out into several blends, Cabernet Sauvignon and small productions of Cabernet Franc and Merlot. The reason they produce Zinfandel is a direct influence of Napa Valley wine pioneers Robert Mondavi and Joe Heitz. After purchasing the property Rich hired a vineyard manager who then recommended he remove the Old Vine Zinfandel growing on the property in favor of a newer higher yielding, more economically viable varietal such as Cabernet Sauvignon. Rich pondered this over and within the first week both Mr. Mondavi and Mr. Heitz had called urging him to preserve this part of the valley’s vineyard history and keep the vines in place. Needless to say, Rich kept the vines and today they range in age from 75 to 130+ years old. As a result, this is an extremely rare and historic vineyard. 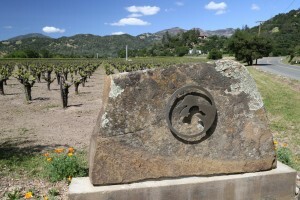 It is one of the two oldest currently commercially producing vineyards in the Napa Valley. There is only one other commercially producing vineyard Napa with vines dating from the 1880’s. That is the the Old Crane Ranch in St. Helena (now The Crane Assembly) containing a mix of various old vine red varietals. 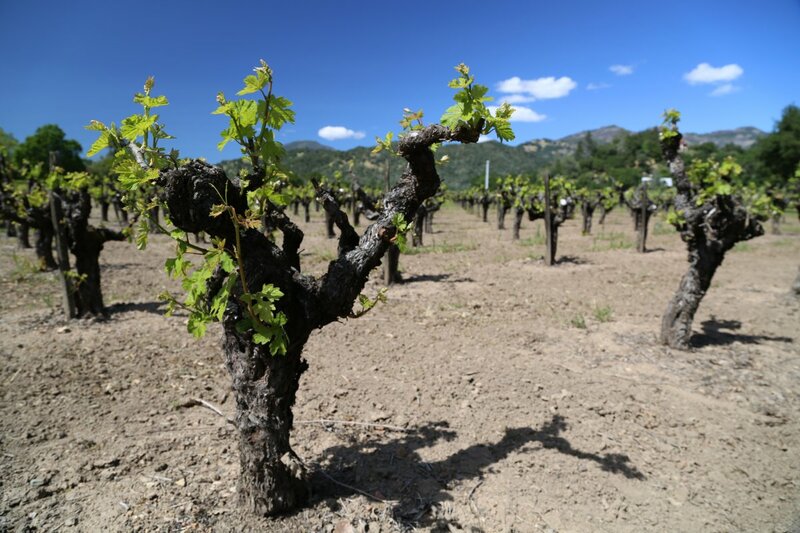 You don’t see vines like these much in Napa anymore – they are all head trained – gnarly looking vines if you will – weathered by time yet still resilient and producing fruit, albeit in small quantities. The vines produce merely between 1 to 2 tons per acre. They are dry farmed – the ground is tilled in the spring and enough moisture remains within the soil for the vines to survive the dry months throughout the Summer and into the Fall. During fairly unusual heat spikes where the much newer non Zinfandel vines were stressed to the point of leaves wilting, the old Zinfandel vines showed no visible stressing at all. Adam’s blend was initially crafted by Rich’s son Adam with the approval of their winemaker Brian Graham (owner of Ramian Estate). This wine is mainly composed of Cabernet Franc and Cabernet Sauvignon with just a touch of Merlot. Like several of their other wines, Adam’s Blend is made in very small quantities. In this case, only 48 cases of the 2008 vintage were produced. The wine saw only French Oak during its aging and no fining or filtering before being bottled. A hallmark of their wines are the very aromatic bouquets. This wine is no different; the nose reveals a nice depth of rich fruit aromas. Flavors of black fig, blackberry and black cherry show on the palate. The finish is somewhat dusty, with medium structured tannins as well as hints of chocolate that linger. The Cabernet Sauvignon is 100% varietal. A whisper of anis comes and goes on the bouquet, but big lingering notes of black berry, and black pepper show – the rounded, opulent palate shows intense ripe black fruit. This wine packs a lot of punch for a Napa Cabernet. First, it is all estate grown, with a fairly small production that varies around 800 cases annually – but the real teaser is the price. Its $30 retail – that is truly value for a Napa grown, hand-crafted Cabernet Sauvignon. 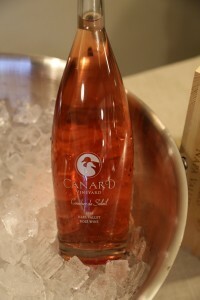 Canard changed their label briefly and then went back to their original label, a “throwback” if you will. Their “Throwback” is a proprietary blend; the 2007 features mostly Cabernet Sauvignon with some Merlot and also Cabernet Franc. The Throwback shows so much fruit on the nose you almost have a tingling sensation! There are aromas of baking spices, ripe plum and dried black fig. The entry is surprisingly soft but gains in complexity rather quickly and is anchored by long dusty tannins on the finish. Their Zinfandel was originally made by Joel Petersen for many years; Joel founded Ravenswood Winery in neighboring Sonoma County. Rich remembers when Joel started making their Zinfandel, Ravenswood was at about 6000 cases of wine annually (wine production at Ravenswood is presently in the 100,000 case range). Candard harvests the Zinfandel several times and they do not “cherry pick” the fruit – rather they pick both the super ripe fruit as well as the fruit that is not quite ripe. Its this combination of fruit that always forms their wine each year. 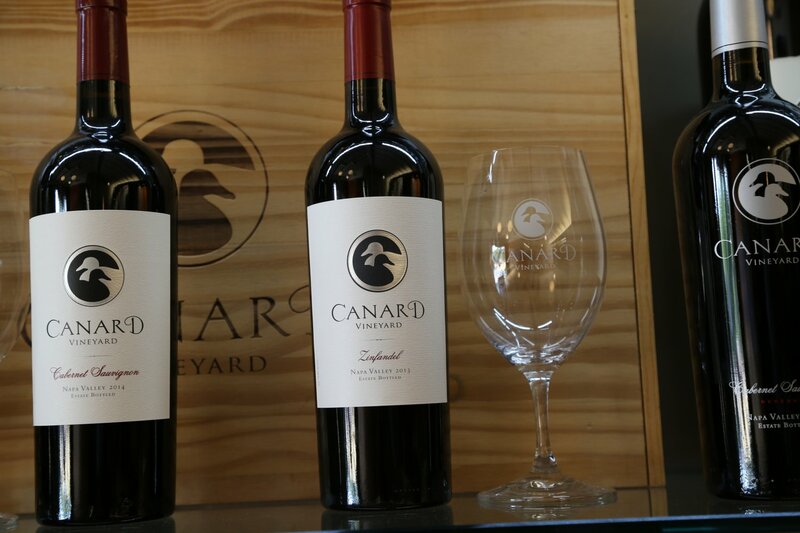 It is rather intriguing to notice the dramatic differences between Canard’s 2007 and the 2008 Zinfandel vintages. The 2007 is a fairly weighty and rich Zinfandel – both on the bouquet and on the palate. The nose shows lots of spice (black pepper) with ripe rich dominant black fruit aromas. This vintage is smooth upon entry but quickly shows a lot of fruit flavors – with sweet notes of black cherry throughout the palate. The finish goes on “forever” with both fruit, notes of chocolate and alcohol. We don’t use “beautiful” too often to describe wines – but the 2008 Canard Zinfandel is such a wine. This is a complete contrast to the 2007. Its clearly a different wine simply by judging the color – its certainly lighter in color, and its younger, yet its already more balanced than the 2007. Everything about this wine is more subtle compared to the older vintage. Baking spices, and soft fruit aromas including cranberry and raspberry show – leading to a rounded palate but with a clean finish that shows reasonable structure. Of the two vintages, this would clearly be the choice to pair with food. The name Canard refers to “duck” as well as Rich’s “middle” name. They are not distributed anywhere in Napa and during our visits Rich wasn’t able to think of any local outlets that carry their wine. As a result the wines are sold mainly through their website and at the shared tasting room at Fairwinds Winery, just south of the town of Calistoga (and basically within walking distance of Canard’s Vineyard). Along with the the Canard wines, Fairwinds also pours their own wines in this tasting room and at times wines from one or more of their custom crush clients are also available. Serious wine enthusiasts can request to meet with Rich at Fairwinds (Rich is one of the more personable and hospitable folks you will meet in the valley and loves meeting wine enthusiasts). Canard also makes their wine at Fairwinds although as of 2018 are in the midst of building their own small winery on their estate. We had a tasting & luncheon at the vineyard in 2010. Wow, the Adam’s blend is something I will never forget, still the best wine I have ever had. My Arborist (& Master Gardener) husband was mesmerized by the grafted vines, cool. We were fortunate enough to enjoy time with Rich at Canard 9-10-18 for several hours. The wines are excellent, the history interesting and the hospitality superb!! What a gorgeous winery and caves. We feel this was the best experience we had in the CA Wine Country.